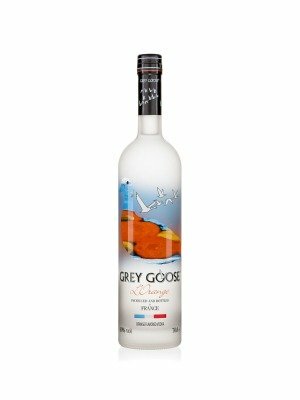 Grey Goose L'Orange French Orange Flavour Vodka is a popular Vodka available from DrinkSupermarket.com in 70cl to buy online. Visit DrinkSupermarket.com for the best price for 70cl of Grey Goose L'Orange French Orange Flavour Vodka or compare prices on our other Vodka products. Greay Goose L’Orange contain the natural essence of one kilogram of fresh oranges picked from Brazil and Florida. It has concentrated citrus oil extract that give a light and crisp flavour that perfectly mirrors the zest of an orange. Where to buy Grey Goose L'Orange French Orange Flavour Vodka ? Grey Goose L'Orange French Orange Flavour Vodka Supermarkets & Stockists. You can buy Grey Goose L'Orange French Orange Flavour Vodka online in most retailers and find it in the Vodka aisle in supermarkets but we found the best deals online for Grey Goose L'Orange French Orange Flavour Vodka in DrinkSupermarket.com, TheDrinkShop, and others. Compare the current price of Grey Goose L'Orange French Orange Flavour Vodka in 70cl size in the table of offers below. Simply click on the button to order Grey Goose L'Orange French Orange Flavour Vodka online now.